General Observations: The first day of November was memorable for a “freak front,” that plowed through our Salad Harvest. “..the salad harvest was going nicely until the weather turned very dark, then wind picked up and heavy rain. A dull roar ensued as hard, wind driven rain pounded down – [the field manager] called the crew to take shelter due the extreme conditions.” I remember as we stood up, the wind swirled around us, sucking all the cut lettuce out of our crates, creating a mini blizzard of baby lettuce… “on return to the lettuce, it proved to be severely damaged by pellet like rain drops, and the harvest was abandoned.” There were some notes of nice days, but more of “frozen ground,” “uncovered crops lost to frost damage”, “late start to harvest due to freezing conditions.” So November continues to be a month where the true character of the crew is tested and the manager struggles to fulfill production goals against increasing challenges. November had the least total worker hours (324), half the previous month and one third of the busiest months. We close operations after the weekend before Thanksgiving, so almost two weeks are just minimum chores and weather proofing. Equipment; 8 Hrs: Ford and hay baler. Notes of the Ford tractor overheating while field mowing. MR cut the field to the north of the Eco-Cluster, controlling woody growth and rejuvenating a nice hay field. A third of the field has been allowed to grow up in adventitious woody species as a dynamic opportunity to experiment with micro climates – woody wind break and southern solar access – needs annual and attentive mowing. Administration; 23 Hrs: The log notes “Afternoon – Workers need to be self motivated.” I gave the crew the same lecture this November, and it rings true as ‘a statement of the end of the season.’ The worker and the manager struggle, usually side by side, but at least in common, towards the goal of finishing this and that task. By the end of the season, it takes a hard push to keep productive, and the manager is usually at the end of their reserves. Even if cheerful, the expectant gaze of idle workers, stirs deeply, in the manager, the desire; that the worker will internalize the practices of the season, mingled with an awareness of current needs, to be self motivated. This is complicated by the change of season, conditions and evolving expectations, and the worker is appropriately looking for guidance! Infrastructure; 39 Hrs: KG noted thanks for use of newly tilled garden in Farmhouse yard, as he cleaned up the seasons debris. Chores hampered by frozen conditions, water buckets are filled before draining pipes, and need to be tucked in non freezing corners. After the last marketing weekend the pressure tank and all water lines were completely drained for the Winter. Water for chores or misc produce washing now comes from the Farmhouse or the Ranch. Greenhouse; 2 Hrs: Tomato vine cleanup from two houses this month. The hours were probably assigned to Crop Care, because the task must have taken 8-10 worker hrs. 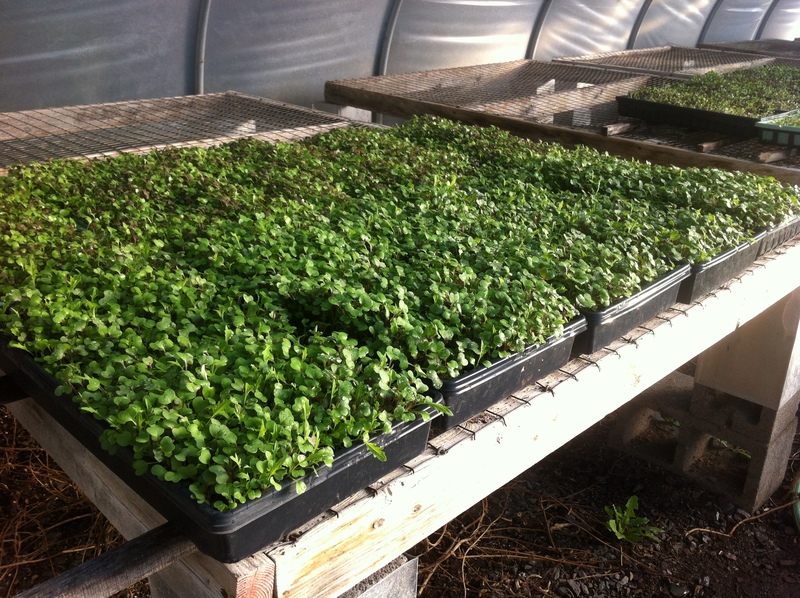 Additionally, KG managed micro greens for sale to the farm ($189 this month), to resell. Composting; 0 Hrs: Each week, there is compost generated in the handling and marketing of produce. A ‘Zero Hours’ hardly does justice to the focus of the composter – who diligently maintains containers to collect compostables, then empties them onto a managed pile in the Composting Area. Here’s to you, Diligent Composter! Crop Care; 29 Hrs: By this time there is no doubt but that the ‘Agricultural fleece’ or ‘Remay’ should be covering any crops that will be harvested or overwintered. KG preparing summary, noted that this season we utilized <20,000 feet of drip tape. Chard under remay protected from frost damage, uncovered it is not viable for harvest! Where there is remay, there are crews tending them with each windy day, sometimes multiple times in a day. Handling; 43 Hrs: With large volume of carrot harvest, MR called Jess from Chickadee Creek Farm, to try out her barrel washer. Constant tumbling and water spray. To get product really clean, still had to be careful not to overload a batch and found best results after pushing the tumbled carrots back to top of (the slightly sloped) barrel a few times. Marketing; 72 Hrs: Labeling our Tomato Goodness Sauce and Ketsup for retail sales. Calculations of time invested in the sauce process and $1 per pound for the tomatoes yields a retail value of $15 Quart. It is an exceptional product, ‘Artisan Sauce’ and well worth the value. The processor, Baumans Family Fruit Butters, is far away, which adds to the cost, but they treat the product well and it is proven in the taste and consistency. Weekly market sales dropping, tomatoes fading out by third week. Noted one week was a Kale cooking demo by Chris of Cherry Grove Organic Farm, wherein “..we all sold out!” With last market of the season forcast to be 30 degrees F. MR put plan in action for extreme vegetable vending! We dusted off a salvaged ‘wall mount’ propane space heater, and purchased a bottle mounted heater element to create a ‘warmth envelope’ at our stand. On actual set up at Summit, we immediately had to give up the idea of tent walls because the wind was too gusty. Ultimately, the wall mount heater was propped on the truck tail gate and produce was served out of the (above freezing) box of the truck. The display was frozen solid all day, as folks asked for something we popped into the box truck to bring it out and encouraged the customer to hurry to their car! Special Projects; 6 Hr: Harvested 72 bales of late cut hay from 4 passes around the outside of CNE Field. The pattern struck me as a way to combine haying and veggie production, that the outside perimeter of a large field might be utilized as the longest straight runs for the hay equipment, leaving the center of the field for shorter rows of tended food crops. Logs reviewed and summary prepared by Rick Morris on September 8, 2014. General Observations: The drama of the small farm peaks in the late season! A succession of hardy greens failed (see ‘crop care’ below! 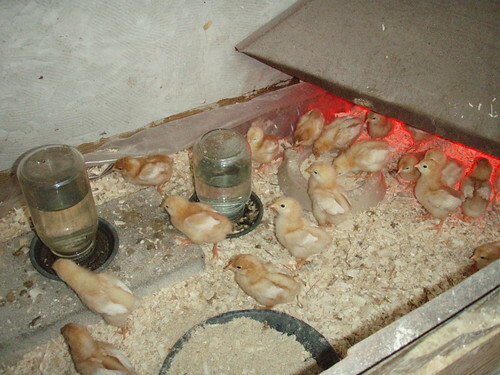 ), a new generation of baby chicks arrived, and apprentices were trained on the big tractors. All the while the crew was constantly busy with the largest harvest month of the year and began preparations for the coming season. 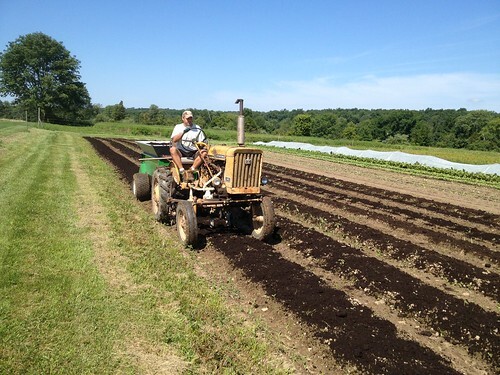 Equipment (21 hrs): Apprentices were trained on the tractors for bed forming and applying compost to the field beds. Key lessons included 1) the importance of an efficient pre-planned driving pattern for shaping beds 2) vigilant observation of tractor implements to ensure they are working the ground correctly and to adjust as needed 3) post-use maintenance prevents next-use frustrations (a forgotten wire begot a dead battery that required replacement)! The Kabota ride-on mower was fixed and returned to the farm and its continual task of maintaining walkable walkways. Administration (23 hrs): A lunchtime training session lent some excitement to the otherwise Sisyphean tasks of payroll and record keeping. Mike broke out the field maps and driving schema to discuss the new planting of strawberries (a North Slope first!) and the fall and winter cover crop plan. At the end of the month, Mike placed an order for BioBags which we use to store and market crops. He used the record of the previous year’s order to figure out the quantity and stored receipts to help in figuring future orders. Infrastructure (68 hrs): As the cool weather begins to roll in the Remay begins to roll out! We rounded up the fabric and rebar hoops to cover cold-sensitive crops. Areas of the farm that are difficult to mow – fence posts, irrigation lines, other problem areas – were tended to with the weed whacker. The whacker hit a line of the electric fencing which was subsequently patched. We moved and cleaned the chicken coops and prepared a home for the new chicks. The truck hit a low branch, smashing the upper corner of the box. The fact that it looks replaceable does little to stem a growing headache. Greenhouse (17 hrs): Greenhouse space was at a premium this month! We began drying the lemon verbena tea in our smallest 6-table hoop house and quickly realized the crop required significantly more space. We decided to clear out a succession of seedlings and microgreens from the larger ‘seedling gothic’ greenhouse in order to dry another 10 tables of the tea. In order to create a proper drying environment we piped out drainage and ensured the fans were operating in peak condition. 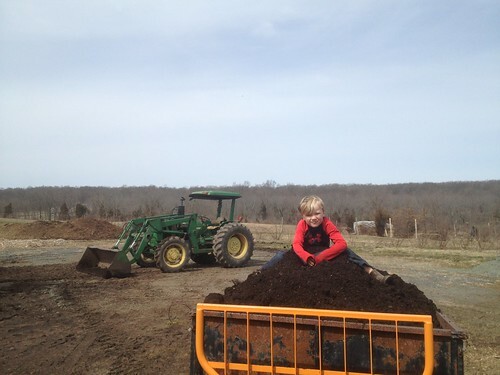 Composting (5 hrs): Newly formed field beds were composted by newly trained apprentice Todd! Crop Care (157 hrs): Kale and Chinese cabbage were covered with Remay at the end of August. By the first week of September the crops failed horribly! Aphids infested these brassicas and the plants appeared to have melted. Special care was given to the perennials as blackberries and apple trees were weeded. Routine care continued as well: we mowed the corner garden’s vigorous weed jungle, wheel-hoed the scallions, staked and strung the green beans, scuffle hoed and hand weeded the crops, and vigilantly maintained the irrigation rotation. One use of all that straw is mulching our greenhouse tomatoes! Harvesting (408 hrs): September saw a 55% increase in harvest hours from the previous month! Besides our regular veggie, herb, and flower harvests, the tomato production peaked, Mike spent several days cutting and baling hay, and the tea was gathered. It seemed that the crew was constantly on the move and small details were missed here and there: the office door was left open with the air conditioner running, a missed wire drained a tractor battery, the logs weren’t kept up to date, etc. Handling (67 hrs): Farming is beautiful. This beauty is never more manifest then when bunching flowers of every color and petal into cascading bouquets of floral miracles. For 25 such bunches in a week in September, we harvested 550 stems between 5 varieties. Harvesting took about 3 worker hours and bunching required approximately 1.5 worker hours. If we say that harvesting and handling labor is worth $30/hr to account for the previous work of tilling, planting, caring, etc., then it cost the farm about $135 to produce the bunches. Dividing that cost by the number of bunches gives us a farm value of $5.40 per bunch. Marketing (152 hrs): Sales were down at the beginning of the month because we did not bring blackberries to market. The display was full of herbs, squash, beans, eggplant, peppers, scallions, kale, cabbage and loads of heirloom tomatoes. The situation suggests an uncomfortable question: What do we sell, and why? Few of us got into this business for money alone (or at all!). Yet bills and staff need to be paid! If squash and hardy greens are the healthiest for the community, but the little berries bring in the most money, then where should be spend more time and attention? Is there anything wrong with reselling another farm’s produce at our stand? What if reselling makes up a majority of the farm’s income? These questions are much discussed. On the less abstract side of things, we noted the importance of having multiple hands loading the truck for market, but the difficulty of attaining labor for such a short period of time at such an early hour. Also, surplus tomatoes were stored and trucked to a processor to make our value-added shelf-stable sauce and ketchup. Special Projects (55 hrs): The baby chicks arrived! Mike picked them up from Moyers on the way back from a sauce run. We set up an incubator coop with a heat lamp. The chicks need special protection from the cold, especially during cool September nights. New chicks with their cozy heating lamp! Week 1: Heavy hot and humid! Sunny by the end of the week. Week 2: Hot and humid days, but cool nights and no rain. Week 3: One steady overnight rain (1 inch) followed by a perfect clear dry week. Week 4: Continued clear weather! Soil is dry and requires irrigation. General Observations: August proved to be hectic and full of activity. Farm visit from NOFA and CRAFT Farm Tour, successions of core veggies continued to be harvested and planted (and even a 100 lb harvest of salad!) and the harvesting of tomatoes and hundreds of lbs of carrots translated to good sales at both SMT and WWCFM. Though, aphids proved to be problematic and Neptune was used and extra care was noted during post harvest handling – specifically for fending off aphid eggs on the under leaf of kale. Admin (46 hours): Accounting and payroll continued as per usual, though with the note that there was a farm audit on 8/13. Another note worth mentioning, KG made an adjustment to the tomato harvest sheet to allow for both location and harvest date tracking. Seeds were ordered for fall planting, and two farm visits took place: Sean from NOFA visited the farm to interview crew about internships and MR prepped for CRAFT workshop on Bio-intensive vs. Bio-extensive at NSF. Infrastructure (45.5 hours): Lots of mowing, moving and cleaning chickens, a recycling run, and the destruction of the old “farmstand bench” near the washing area were all logged. Also, as a note, the farmhouse had some plumbing issues – both toilets and dishwasher seemed to quit functioning properly. Technicians were called in to remediate the issues. Greenhouse (20.5 hours): Tomato care and seeding dominated the greenhouse hours. Tbe tomatoes were given time to clip, mulch, and deal with early blight. The troublesome blighted plants were bagged and buried. Besides the tomato care, seeding veggie successions happened over the course of a week around the middle of the month. The crew was waiting for a seed shipment to finish the succession. Later in the month, the crew noted that the seedlings were consistently “leggy” with no roots. 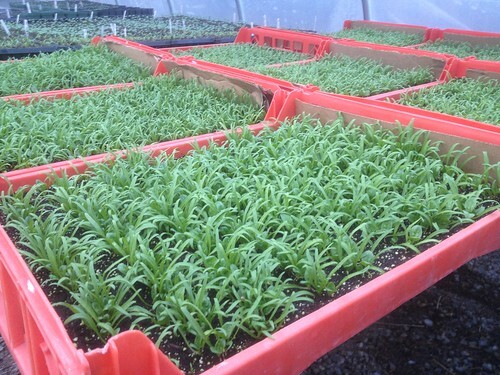 Full summer foliage could have blocked critical sunlight to the seedlings. Compost (5 hours): The 140 and spreader were used to get loads of compost over the fields in preparation for planting. Planting (109.5 hours): From the beginning of the month, crew worked hard to stay on top of planting. Efficient work led to quick work – notes of planting 5 BGB before lunch on both 8/6 and 8/21! Crew members received training from MR regarding bed forming, stale seed beds, and making sure the entire crew is “aware of the plan” for planting and the steps necessary to implement the plan. Crop Care (215.5 hours): Lots of hand weeding and scuffle hoeing to save lettuce, carrots, leeks, and other crops. 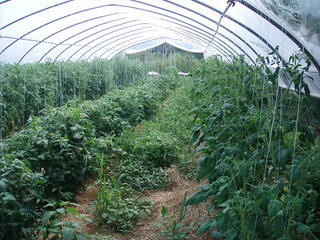 Tomatoes in the field and greenhouses needed trellising and mulching. Lemon verbena grew to the point of needing trellising in the corner garden. A long note was made to discuss the aphid infestation on field crops. Crew applied M.Ped and Neptune to 6 field beds in MFSEN. Crew used a combination of a watering wand, “old sprayer” from barn top, and the 140 with tank and went through 200 gallons of mixture for 9 beds for the day in an attempt to curtail the aphids. Another note of crop issues was noted on 8/22 where kale, chard, beets, cabbage were all “seriously effected by some sort of wilt causing disease.” Were these due to being covered under field tunnels? Harvesting (264 hours): Down 110 hours from last season and 310 hours from 2011, harvesting seemed to be down due to a combination of greater efficiency and lower yields. On 8/1, crew noted that harvest went quickly due to “small yields.” Elsewhere in notes, crew lauded their efficiency. 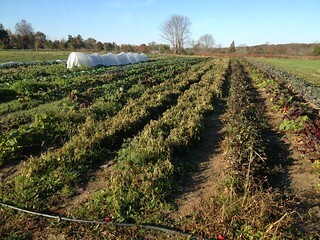 Crew harvested blackberries, squash, field and green house tomatoes, salad mix (CH handled 100# harvest! ), carrots (+200# beds), and core hardy greens. Handling (50 hours): Handling included all Thursday and Friday harvests, garlic cleaning, and eggs. During the aphid plague on 08/13, the Kale was reported to have lots of aphids. Proper attention was given to properly handle the kale as to remove aphids as best as possible. Special Projects (1 hour): Although noted as just one hour, many more hours were spent with Harvest Moon CSA @ NSF. KG and RR used farmhouse garden to grow tomatoes and basil which was wholesaled to NSF for sale at WWCFM and microgreens that were wholesaled to NSF for sale at SMT. As for microgreens, August was a good month to show the good and the bad with micros. On 8/9, KG harvested 47 1 ounce units of micros for a potential $211.50 if all sold. On the other hand, microgreens proved to be finicky. On 8/14, KG lost “another succession” of micros because of not being uncovered on time. Overall, microgreens seem like a high yield product, though proper care and attention must be paid. Week 1: Light rain, warm and humid. Week 3: Cool nights, saturated soils, but nice weather. Heavy dew in the AMs noted. General Observations: July was another hot month but things carried on at the farm. The crew was able to get a lot of weeding, mowing and other maintenance taken care of leaving the farm looking tidy and awesome. Mike was out for some time because of back injury but Colleen was able to manage the farm and keep the crew hard at work. Equipment (70 hrs): Despite the difficulties with machinery last month, the crew managed with what was available: The Kabota got some mowing time in before getting stuck in the eco cluster. The John Deer was used to load compost into the trailer for easy compost spreading, and the Billy goat helped with the BGB cleanup. The weed wacker was used to clean up the pathways and edges in the corner garden. Also, the ATV got looked at and it was decided that a part needed to be replaced. Administration (63 hrs): Mike is out for a few days due to a bad back. Colleen takes responsibility for ongoing farm operations and crew members pick up some extra tasks like payroll and other paperwork. Infrastructure (87 hrs): The crew worked around the farm to get it nice and trimmed. The farm perimeter got mowed along with the area around the peach, cherry and hazelnut trees. The farm stand area and the walk in cooler were all cleared out. It took some work but the farm looks kempt. Greenhouse (61 hrs): While thinning, Colleen noticed that the Swiss chard is being seeded too heavily. It was recommended that it be seeded at 1-2 seeds per cell. The following vegetable succession was seeded (7/17) and two interns are assigned to seed the one after that (7/23). Overall, things were running smoothly in the greenhouse. Composting (10 hrs): Compost was laid on a few beds in the Corner Garden and 3 Big Garden Beds. A trench was filled with compost for leeks and scallions. Compost was also laid on 4 beds in Central Field South to prepare for planting (7/9). Planting (119 hrs): New Vegetable and Flower successions were planted! Carrots and lettuce (3 varieties: red oak leaf and green and red romaine) were planted in 2 big garden beds. The crew direct seeded 4 beds worth of beets in the central field. Also, 2 beds of cucumbers, 1 bed of kohlrabi and 2 beds of basil were planted in the corner garden. 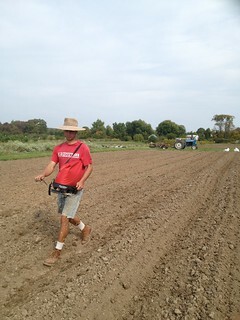 The crew direct seeded 2 Big Garden Beds with field lettuce and planted kale, chard, beets and cabbage in field beds. Flowers were the last thing planted this month. (7/27) Planted 2 beds of flowers and (7/30) planted 4 beds of flowers. Crop Care (306 hrs): As always there is much to do crop-care wise around the farm. Greenhouse tomatoes got hit first with some weeding and pruning. Then the field tomatoes and leeks were next. Both were weeded and mulched and the tomatoes were strung. Other things also got weeded such as: green beans, salad mix, carrots, grapes, blackberries, kale, and chard. The Green Oakleaf Lettuce was unfortunately abandoned because of “crazy grass growth”. (7/18) A note is made about the importance of keeping a constant cycle of irrigation going especially in times of high heat. (7/22) The crew used the 100 gallon tank to water the trees. Harvesting (363 hrs): (7/10) Green beans and Summer Squash are cleared from the Big Garden Beds. As usual kale, chard, beets and salad mix are all harvested. However, on 7/12 the number of pounds desired was 80. However, 76 pounds was all the crew could get. (7/15) 4 tables of Mountain Mint were harvested. (7/18) Flowers were harvested for bunches. Towards the end of the month the carrots were too mushy and the decision was made to not harvest. Handling (88 hrs): (7/4) Mike started off the month by donating extra produce. (7/5) Then, Colleen trained the crew in hydrocooling, and explained difference between “producer” and “processor.” After that, things fell back into their regular groove. The crew hydro cooled kale, chard, beans, and salad mix. (7/21) Mike washed eggs while Colleen bunched flowers. (7/25) Crew focused on importance of “containers” and harvest log. Marketing (115 hrs): (7/7) Markets seem slow. This was possibly due to heat wave and holiday weekend. (7/13) Markets picked up. Decent amounts of produce sold at both market but it was still not a busy as usual. (7/21) Third tent set up for the first time at markets! However, there was a lack of: beats, radishes, and eggs. Note was made that cases of portabella mushrooms were moldy and not sellable. Also, packing micro greens at market was not working, and time should be set apart during the work week to pack. (7/27) Both markets very busy (yay)! Market managers counted 913 cars. At West Windsor, we almost completely sold out and at Summit we made $4075. Special Projects ( 19 hrs): (7/2) Micro greens harvested, and sunflowers were sampled. (7/11) Micro greens were and cilantro was added to the mix. (7/23) 12 trays were seeded. Note is made that harvesting should be done during the work week preferable on Friday, and sun flowers need to be harvested early (before fuzzy true leaves show) for best taste. Week 1: Heat wave. Rainy, humid week. Temperature started in the mid 80s but ended in the 90s. Week 2: Heat wave. Temperature in the 90s. Thunder storms with heavy rain. Week 3: Heat wave still going strong. Temperature in the high 90s. No rain, dry conditions. Week 4: Heat wave finally comes to an end. Temperature in the 80s. Thunder storms with heavy rain. Humid days. General Observations: Extreme heat, heavy rains, and several equipment malfunctions interrupted the normal flow of day-to-day work. The rain allowed us to catch up on some administrative tasks, and a big push for planting at the end of the month kept the farm chugging along. Equipment (50 hrs): The blessing of machinery is that it allows the farmer to get more done faster. The curse is that some months you just have to spend a lot of time tending to the machines. The ATV broke down three times and needed to be repaired. The big John Deer tractor had a mysterious leak. The Kubota ride-along mower stalled enough that it was left out in the field in the midst of an uncompleted job. Yet, the farming continues!! Some equipment was interchangeable – eg. the small International tractor could pull the ATV’s trailer while the ATV was out of commission. 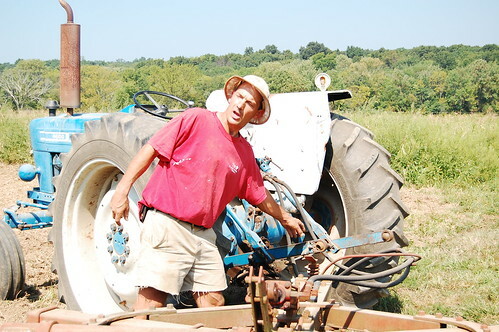 Mike demonstrating an important element of the tractor. Administration (48 hrs): Organic certification paper work was updated, filled, and filed by 2nd year apprentice TH. The regular cycle of business paperwork continues, with its yearly, monthly, and weekly cycles. Federal and state property taxes were filed and paid, bank statements were reconciled, and the crew was paid. The long stretches of rainy days gave time to work on the website and catch up on emails. Infrastructure (93 hrs): The grass was growing fast and mowing had to keep up. Keeping the alleyways between beds and through the fruit cluster is important so that the crew can move about efficiently. Keeping the weed pressure in check on the shoulders and ends of beds requires vigilant attention with the weed whacker. This work often occurs on days when light rain prevents other tasks, though heavy rain prevents the mower from operating effectively. Misters were purchased to increase irrigation capacity. We cleaned and opened the farmhouse pool! It was ready just in the nick of time for the Summer Solstice party. 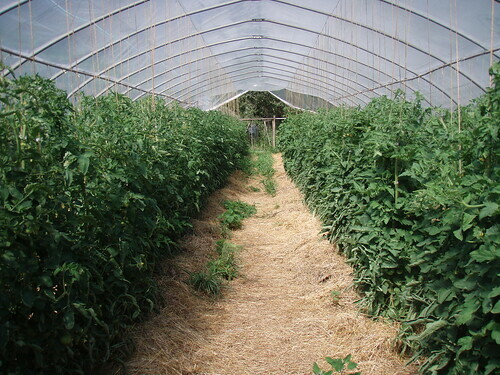 Greenhouse (44 hrs): Greenhouse tomatoes were trellised and pruned a few times. During hot weeks the greenhouses need to be checked to make sure they are receiving adequate irrigation. 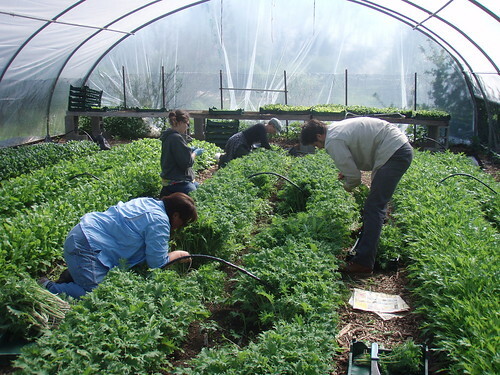 Clear communication between the manager and crew was essential to make sure that the right amounts of crops were started in the seedling greenhouse. Composting (15 hrs): We were able to spread compost during the drier parts of the first and last weeks of the month. 6 big garden beds and 6 flower beds were prepared early on, and a number of field beds (10+) at the end of the month. Efficiency was improved by teaching the crew the best positioning of the ATV trailer relative to the compost pile. A good position allows the big tractor to fill the trailer with minimal movements. Planting (151 hrs): The 579 field received its first flowers on June 1st! More flower beds were shaped and planted by the end of the week. Heavy rains prevented planting until the end of the month. The last week saw a big push for planting. One day saw a new succession of direct seeded salad mix lettuces, three rows of tomato transplants, and half a row each of pepper and eggplant transplants. Another big day gave us a new succession of transplanted kale, chard, mizuna, squash, and artichoke as well as directly seeded beans. Crop Care (202 hrs): When rain abounds, weeding abounds all the more fully! The fruit and nut trees were grateful to be tended, but the delicate onions flopped over and exposed their roots. A gentle touch is required. To the delight of all, a brief interlude of sunshine enabled the crew to flame weed the carrot beds 7 days after seeding. The quickly growing tomatoes were strung in the first week, and newly planted beds received irrigation lines in the first and last weeks of the month. Harvesting (286 hrs): Flowers started getting picked with Sweet William and peonies on the 1st, during which we also picked collards, head lettuce, parsley, asparagus, and kohlrabi. The dry weather allowed for straw bailing. On Thursday of the first week, the crew arrived early (7:30am) to harvest the hardy greens and root veggies before the sun shone too strongly. The next day we harvested salad mix, head lettuce, and parsley in the rain. 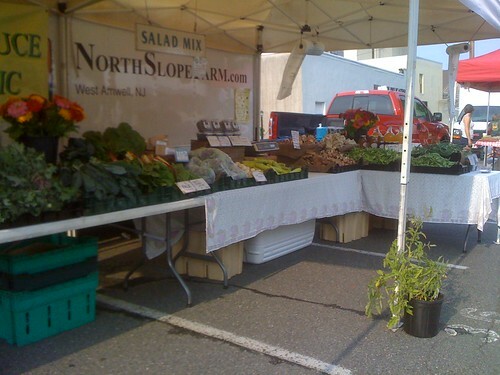 Saturday, more lettuce, parsley, radishes, and kohlrabi were harvested for the Sunday market. As the harvest month wore on, we noticed animal holes among the radishes in the corner garden, though they still yielded 37 lbs. By the end of the month, we harvested squash, tomatoes, onions, scallions, scapes, turnips, microgreens and bee balm in addition to the standard hardy greens and veggies. With a large diversity of crops heading to different markets and filling a couple of special orders, it is of paramount importance to maintain a clear and up-to-date harvest sheet. Keeping everyone informed and on the same page is key to efficiency. 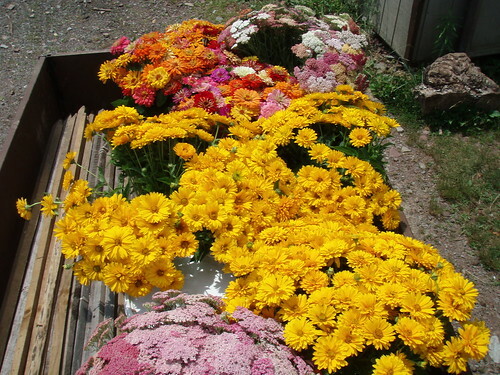 A harvest of flowers ready for market! Handling (80 hrs): The weight of the salad mix changes dramatically when it is harvested in a heavy rain. 85 wet pounds turned into 69 lbs after handling. Egg washing and packing continues with the lesson that eggs should be packed with their pointy ends down. Marketing (141 hrs): In addition to the normal West Windsor and Summit markets, 80 heads of lettuce were sold to Brick Farm Store. Blueberries and tomatoes were purchased from Zone7 to sell at market. In a dramatic turn, Summit Downtown, Inc. duly informed vendors that the location of the market was moving. Mike and fellow farmers found the new location unacceptable on a number of fronts, rallied together, and protested the move. Read Mike’s article by clicking here. The farmers successfully convinced the board of trustees to vote against the move. Read Mike’s note of appreciation by clicking here. Summit Market - here to stay! 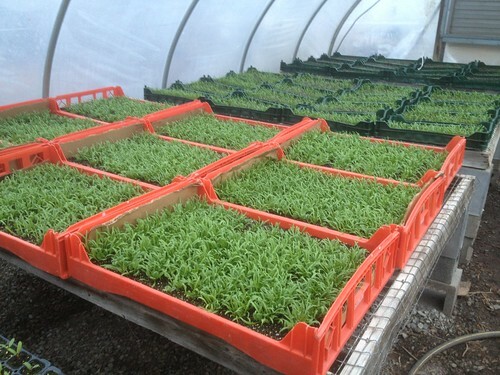 Special Projects (8 hrs): Microgreens yielded a stead 6-8 units per variety. The number of trays per succession was increased to 4. Week 1: Started hot (90’s! ), ended with a tropical storm. Week 2: Rainy and saturated soil conditions. Serious thunder and lightening. Offered a day off to the crew because it was too wet for most tasks. Week 3: Rain rain and more rain. The sun started peeking through by the end of the week. Week 4: Sunny days turned into HOT days. Threat of thunderstorms all week, but they held off until July. Logs review and summary prepared by Jacob Thies. General Observations: Markets up and running, wholesale seedling orders to WHC, all crew members finally together, some unseasonably low night temperatures (5/14-15 & 5/26) that led to major tomato set back, but rest assured, May finally revealed her warming smile with highs in the 90’s and warm nights in 70’s by Memorial Day weekend. May lends itself to be busy, productive, and many variations in weather. Equipment (80 hrs): Case: 9, Kabota: 15, JD: 13, Ford: 17, IH: 7, Walking Mower, 4, BCS Roto: 4, Weedwacker: 11. Almost identical total hour usage when compared to May 2012. Cut cover crop in Veg C mid and Veg B mid and baler used to bale up cover crop on central fields. Lots of general mowing and weedwacking around the farm as a product of spring rain and sun. Big Red was put to work for cultivating new beds. MR continued supplemental training for trainees regarding usage of tractors. 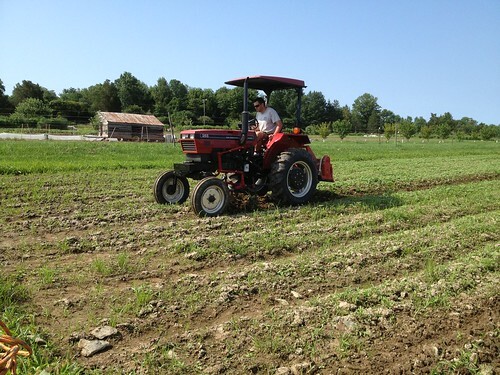 By mid month, more primary tillage (MSE South) and tractor cultivation with Big Red, specifically garlic. Administration (55 hrs): Crew received training on the use of Quicken program. Made and placed an irrigation order to Rainflo (details of order not mentioned) & inventoried tomato stakes (5/8). MR trained TH on payroll, accounting, and a general introduction to the Element (5/14). Updated crop plans for corner garden and made note of opening for green beans and more radishes, carrots, and turnips (5/27). Owen joined the crew and received formal introduction. Total Admin up 10 hours from previous year. Possibly due to TH taking on Admin Element leading to additional training from MR.
Infrastructure (79 hrs): General maintenance including moving of chickens, mowing, weedwacking, and subsequent fuel runs to manage upkeep around the farm. Hay bales were collected from the central fields, 579 North mowed out in preparation for primary tillage, covered crops mowed, and primary tillage performed. Greenhouse (136 hrs): Overall, there was general upkeep of the greenhouse from watering to seeding to potting on. On 5/8, crew began new seedling orders for WEC. Special note that there was a tomato variety supply crisis created by “poor planning.” Not enough supply to meet the demand. Note of emphasis to “address current shortage and assure ample production for next year.” MR gave greenhouse introduction to MB & BY detailing greenhouse order form, organizing greenhouse tables, proper potting on methods. Prepped Farmhouse Gothic for tomatoes by hanging strings on 5/22. Composting (38 hrs): Compost was continually sifted throughout the month for potting and seeding. On 5/5, crew composted sweet William and hyssop along with the southern most 100’ bed and northern most 50’ bed in CG. 5/7 crew composted Veg C Mid in preparation for tomatoes. On 5/31, BGB SW 1&2 were composted. Planting (177 hrs): On 5/1, crew started the month by seeding lettuce in BGBs. 5/5 found crew thinking tomatoes and used Haybine to cut cover crop off Veg B and C Mids with intention of plating tomatoes soon. Two days later, Veg C mid was prepped for tomatoes on 5/7 and planted tomas, leeks that afternoon. On 5/10, direct seeded intercropping parsley and onions in BGB. On 5/13, focus moved to CG where 3 short beds were seeded with H. Turnips. 5/14, 2 more BGB were planted with beans. On 5/15, RR & KG seeded more lettuce in BGBs. On 5/23, tomatoes were planted in Veg C mid. On 5/27, crew seeded 100’ bed in CG with green beans on shoulders and cantaloupe down center. By the end of the month, crew began next eggie succession beds and the beds for first flower succession. Noted that primary tillage was late and extra rototilling was required to speed up breakdown of residual cover crop. Harvesting (229 hrs): In preparation for first markets of the season, training was given to first year trainees regarding sanitation, harvesting techniques, and tools. Crew harvested a multitude of crops including arugula, mizuna, kale, tat soi from Ralph’s House, spinach, radishes, salad mix, asparagus, and microgreens. The majority of the crops were available throughout the month for Saturday and Sunday markets. By the end of the month, NSF was harvesting dill, oregano, spearmint, and head lettuce for market. Handling (101 hrs): Hand in hand with harvesting, MR gave training to first year trainees on 5/10 regarding product handling standard operating procedures. On 5/1, stinging nettle was harvested and handled for drying. On 5/8, crew bagged and labeled hyssop and nettles. For the rest of the month, crew spent handling time washing, spinning, and bagging salad mixes and cleaned bunched greens. Marketing (91 hrs): Market season began! In preparation for seedling sales to WEC, crew marked each individual cow pot and four-pack for sale with plant ID labels. On 5/6, NSF sold four pounds of dried stinging nettle to Cherry Grove Farm for their Nettle Jack Cheese. The middle of the month saw us with great market day weather and successful sales days. 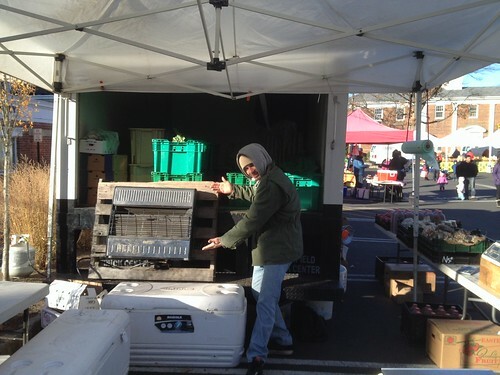 The third week was cold and windy for Saturday but warmed up for a successful Sunday market. Special Projects (4 hrs): KG seeding, tending, harvesting, handling microgreens throughout the month. Noted that there was a missed succession but problem was resolved and back to normal seeding. Week 1: Sunny, warm, and dry. Night time temps hovered in the 50s. Week 2: Week started warm but cold and wet by the end. Night times dropped as low as 34F. Frost killed 5/7 planted tomatoes. Week 3: Cool temps and rain to begin the week, though it gave way to warming weather and sunshine by the end of the week. Week 4: Rainy, cool, and very windy. Unseasonably low night temperatures. End of the week brought hot (+90F) by the end of the month. Logs reviewed and summary prepared by Malangie. April was a busy month. The crew worked on special projects such as the spinach trials and growing microgreens. The regular day to day work was kept up of course i.e. seeding, planting, and weeding. But they also dealt with unexpected challenges along the way: Frost took some tomatoes and basil while a chicken sickness claimed the life of a chicken. (4/5) Big Red returned from repairs. (4/7) Replaced battery on IH140 and tires on both Kabota and Case 265. (4/14) Introduced 2nd Years to starting and servicing the Kabota. Weed wacked corner garden bed edges, pathways and tops to prepares them for planting. Mowed garlic bed edges with Billy Goat in preparation for tractor cultivation. 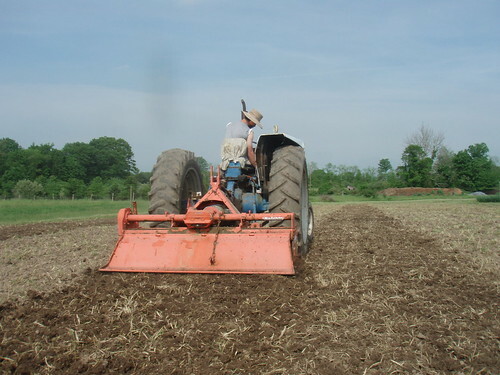 (4/18) Introduction to the BCS Rototiller which was later used to till 2 Big Garden Beds. (4/29) Mowed Central Southeast Field and introduced new mowing skills such as adjusting widths and proper positioning for mowing along the fence line. (4/1) Hour sheets made and the crew took a short field walk for discussion. (4/4) New crew uniforms arrive! (4/11) Introduction to the farm’s finances: account reconciliation, bills, payroll ect. (4/12) Market and WiC application filed. (4/15) Note made that a crew working together with a leader is better for morale. (4/6) New coat rack made for SHOOP. (4/15) Note is made that maintaining clean, clutter free work areas also increases morale. (4/17) Hens moved winter quarters to First Field in 579 Northwest end. (4/19) Purchased new feed from Lakeview Organics and will compare it to the Nature’s Best feed. (4/28) Mowed Corner Garden’s access and borders, field below compost area and the alleys in Vegetable Garden B North Perennial and Vegetable Garden A North Perennial which would provide smooth ride for the IH140. (4/29) Compost delivery arrived. (4/2) 4th succession of basil seeded along with 5th succession of trial spinach. (4/3) Made more room available in greenhouse by moving some of the spinach trial to tables in the farm house gothic, some kale and cabbage (from 1st Succession) into the hoop house with extra remay. Also seeded red and gold beets for 2nd Vegetable Succession. (4/5) Finished 2nd Vegetable Succession and moved beets, Swiss chard, collards and trial kale into hoop house. Also, started potting tomatoes for the market. (4/11) Took inventory of herbs available for sale. (4/12) Finished potting tomatoes for market and came across space issue in the greenhouse which pushed the idea of moving the house tomatoes into Farmhouse Gothic (hesitated because of cold forecast). (4/16) Began seeding first flower succession. (4/20) Finished potting herbs for sale and took inventory to fax over to WEC. (4/21) Frost damage in Ralph’s House to market tomatoes (15 count) and basil (32 count). The seedling death continued in hoop house where the tomatoes and basil without secondary remay were 50% frosted. (4/22) Further assessment of the loss highlights the shortage. Decision is made to use both own and market seedlings to plant in Farmhouse Gothic and use newly seeded tomatoes for main crop. This will ensure that there will be enough planted to supply the farm and have some extra for seedling market sales. (4/9) Training in spreading with Earth and Turf. (4/15) Composted short beds and east border beds in Corner Garden. (4/23) Composted Vegetable Garden A & B North Perennials (used up 1 big trailer). (4/24) Composted 3 Big Garden Beds and then broad forked them. (4/29) Took a quick walk to the compost area and decided where to have the net delivery dumped. (4/3) Cleaned up remay, sandbags and some plastic from Big Garden Beds, Vegetable A & B and Central Field. (4/4) Got some weeding done in Farmhouse Gothic. Then moved onto weeding the garlic beds. (4/14) Used a trailer load of woodchips to mulch South border bed in Corner Garden where tulips are. (4/15) Hand weeded Hyssop and Sweet William. Also scuffle hoed peas. (4/17) Weeded in Ralph’s House and used the 265 to get in between garlic beds and make hand weeding easier. Also, weeded some asparagus. (4/18) Started up the irrigation for the Big Garden Beds along with remay and sandbags. (4/19) Finished asparagus weeding and moved onto strawberries. (4/23) Weeded the herb garden, fertilized older fruit bearing trees and got Casey’s placental tree. Also got another hour of weeding the strawberries in and worked on 3 garlic beds. (4/27) Set up more irrigation in the Big Garden Beds, Perrenials, Veg A, Corner Garden and the green house. Note is made to stay on top of irrigation rotation and remay management. (4/28) Used the IH140 and 100 gallon tank to water fish and kelp onto strawberries, peas, collards, kohlrabi, head lettuce and herbs in the Corner Garden. (4/21) Harvested a tray of spinach which yielded ¾ lbs. (4/18) Harvested and weighed spinach. (4/26) First harvest of stinging nettle. (4/14) Washed, packed and delivered eggs to WEC. Note made that the ‘New Girls’ (’12) are still laying small eggs. Spoke to Stalin from Nomad (NAME) and he took 2 dozen to see if he could use them. (4/27) First seedling delivery to WEC ($444). A beautiful display of tomatoes and basil was set up. (4/11) Ordered 200 containers for microgreens. Later, discussed spinach trial and pricing. (4/12) Worked on photoset for spinach trials and set up irrigation for microgreens. (4/14) Chicken coop clean up day! Also worked on some fence extensions for the ’11 Girls. (4/18) Seeded 1st Succession of microgreens (4/26) Quarantined bird from day before now dead. On further inspection of the flocks, they both seem to have same sickness. Sick birds isolated from healthy flock and plans made for them to be culled. Week 1: Sunny during the day with cold even freezing nights, dry conditions. Week 2: Warm days lead to a heat wave with and thunderstorms at night at the end of the week. Week 3: Sunny, yet windy and cool, saturated conditions. Week 4: Sunny with a bit of overcast in the afternoons, hot and dry towards the end of the week.